In our continuous effort to keep our platform state-of-the-art, we have added new, optimized features you can start benefitting from today. With Smart Folders and advanced filtering options, we provide companies with the ability to take full control over the way they organize the inflow of mentions to provide faster replies. Moreover, with Custom User Roles, you have the ability to put together a unique set of responsibilities for each individual user, depending on their role within the organization (e.g. Customer Care Team Leader, Marketing Manager, Care Agent, etc.). We have also added a new responsibility for Custom User Roles that simplifies the setup of the Inbox even more. By restricting the access to specific Mailboxes, agents are able to focus more on those mentions that need their full attention. In addition, by restricting the number of labels agents can use to tag certain mentions (e.g. to use for reporting purposes in later stage/route mentions to a specific Smart Folder/etc.) companies are able to keep their data “clean” and gain control over it. Oftentimes, too many ill-used tags simply clutter up your Inbox. The overload of tags can cause confusion in a later stage. From now on you can use Canned Responses to add snippets (i.e. extra text) to your replies in our new Inbox. Use this new feature to quickly add in relevant information to complete your reply such as a bit.ly link to your support page, your web support number, or an email address. Not familiar with the new Inbox yet? Catch up on all the features here. A lot of our users use the dashboard feature for adding in widgets that allow them to see only the dataset that’s relevant for them, especially for reporting purposes. We have now launched a useful update of the Inbox widget that displays a list of the most recent mentions (i.e. a column that updates in real-time) in a slimmed view. This can be useful to monitor in real-time what’s landing in your Inbox and, for example, in your contact center so that Customer Care Team Leaders can keep an eye on incoming data at all times. You’re able to adjust the layout of the widget to showcase your data in a way that you can scroll endlessly. The widget can be configured to automatically load new incoming messages so you can get a grip, at a glance, on the most recent mentions and understand what’s being said about your brand at this very instant. Just created a really cool widget you want to add to another dashboard? You can now copy widgets to another dashboard. To do so, simply click on the drop-down menu in the widget and select ‘copy’ and the dashboard you want to copy it to. You can use the Twitter List feature to group certain people and categorize them. For example, you can create lists for topics like ‘Influencers,’ ‘CX Experts,’ ‘Tech Companies,’ etc. to help organize all the Twitter profiles you’re following. Companies also use Twitter lists to group their own social profiles. As of now, you can add people to a specific Twitter list straight from within the Engagor platform. In the Engagor Insights in the ‘Posts & Engagement’ section, you can now see which replies and comments received the most engagement by selecting ‘Top Replies’ (in addition to filtering on ‘Top Posts’ and ‘Profile Posts’) and analyze which content resonates with your community. When people are working within the Inbox responding to messages, agents can assign mentions to each other and help each other out. For example, you can assign a message to someone if that person is more suited to answer a specific question or case. When someone is assigned to handle a message, every new, incoming mention from that same customer will automatically be assigned to the person that handled the initial message. With the new Available/Unavailable Button, each time an agent takes a break or is unable to respond, they can set themselves ‘unavailable’. This way, new, incoming mentions will not be assigned to someone who isn’t able to respond at that specific moment. This ensures faster response times. When someone sets himself unavailable, handle time will obviously not be taken into account. Do you have other, great ideas on how we can improve our product? We really value your feedback as a user of Engagor so don’t hesitate to let us know on Engagor Ideas! 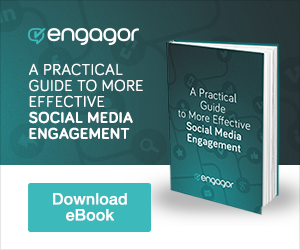 The post 6 New Engagor Features You Can Benefit From Today appeared first on Engagor.